Dallas Goldtooth (Mdewakanton Dakota & Dińe) leads the Keep It in the Ground Campaign of the Indigenous Environmental Network. He is the son of Tom B.K. Goldtooth, the globally recognized activist and founder of the Indigenous Environmental Network. Dallas represents a new generation of leaders who organize using social media to amplify on the ground activism. He travels extensively across Turtle Island to help fossil fuel and hard rock mining impacted communities tell their stories through social media, video, and other forms of communication. Dallas is an Indigenous Environmental Network (IEN) media team lead, working with IEN staff, board, and organizational partners from a diverse group of climate justice networks. 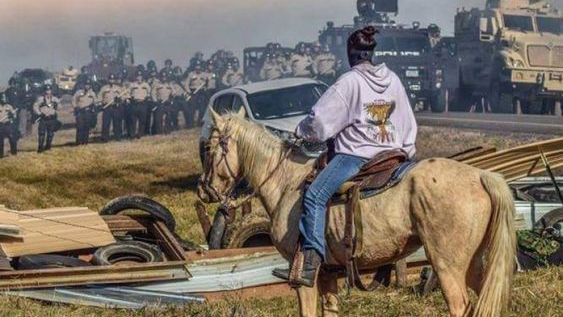 Along with his many tasks and duties with IEN, he is also a Dakota cultural/language teacher, non-violent direct action trainer, and was one of the outstanding Water Protectors at Standing Rock/Oceti Sakowin Camp fighting the Dakota Access Pipeline. In addition, he is a co-founder of the Indigenous comedy group, The 1491s, a poet, journalist, traditional artist, powwow emcee, and comedian. Dallas’s advocacy and work on issues like the Dakota Access and Keystone XL pipelines has been featured in publications such as The Guardian, Al Jazeera and Los Angeles Times.